Cornell Woolrich was one of the most popular writers of crime/mystery fiction in the mid twentieth century. He also wrote under the names William Irish and George Hopely. Today he’s largely forgotten at least on the written page. But I’m not going to talk about him as a writer per se. I’m going to talk about him as the hardboiled or noir writer who’s had more stories adapted for film than any other. To give some idea of his popularity on celluloid, on IMDB there are 103 movies credited to him, including foreign movies. Chandler has 37. Hammett: 33. David Goodis 19. Mostly these are “based on” credits, but Chandler, Goodis and even Hammett actually wrote screenplays (the latter for Watch on the Rhine, not a mystery or noir, but a World War II propaganda flick). 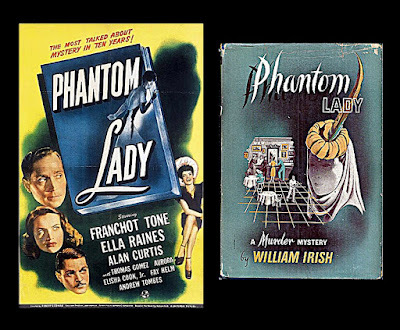 The first movie based on a Woolrich story (writing as William Irish) was The Haunted House in 1928. The credit reads “titles,” so I assume that means he was writing the titles for a silent movie. The first flick credited to a story of his is Children of the Ritz (1929). The last movie listed on IMDB based on one of his stories is She’s No Angel (2002), based on I Married a Dead Man, which had been filmed several times before both domestically and in other countries. The American version was called No Man of Her Own (1950). So 1928 to 2002 is a pretty good run, with over a hundred adaptations. And I suspect it’s not the end of his run. 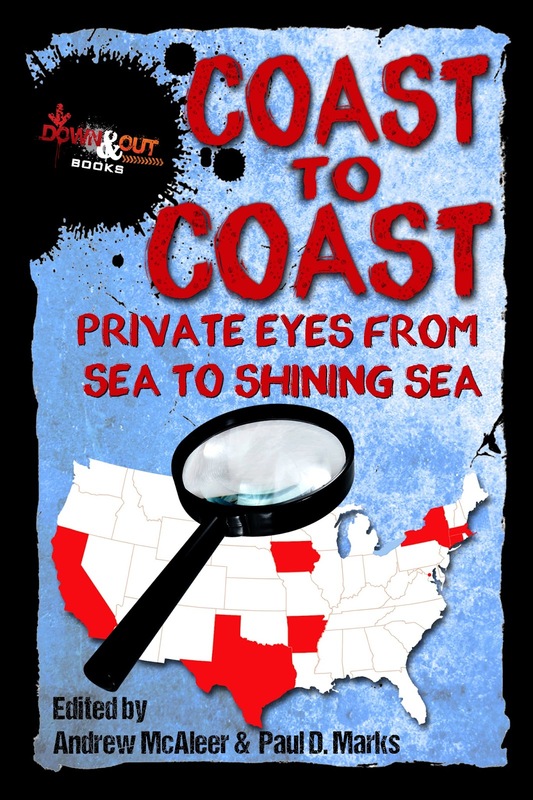 Woolrich started out writing Fitzgerald-like stories, but found his niche in the mystery-suspense field, writing both short stories and novels. He spent some time in Hollywood but eventually returned to New York, where he lived in a hotel with his mother until she died, then he moved to another hotel. In the early days of his return to NYC he socialized with fans and MWA members. But alcoholism and the loss of a leg to gangrene because of a too tight shoe and the infection it caused, plus not going to the doctor soon enough, turned him into a recluse. A closeted homosexual, he spent the last years of his life alone and lonely. Nobody attended his funeral in 1968. 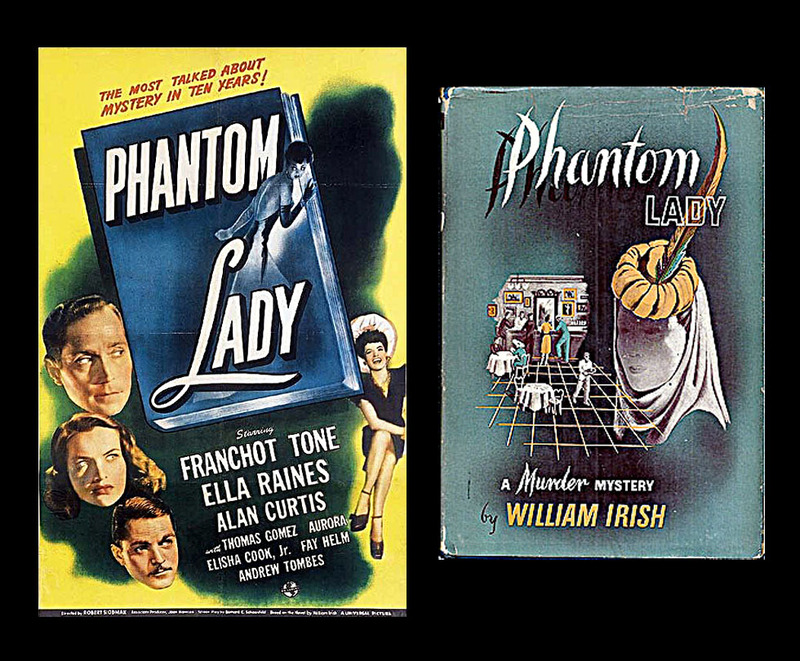 Phantom Lady, 1944: A man (Alan Curtis) and his wife have a fight on their anniversary. He takes a powder and picks up a woman in a bar. When he finally returns home he finds his wife strangled with one of his ties, the police crawling all over his place. And guess who’s the prime suspect? At first the only person who really seems to believe in him is his secretary, the bewitching Ella Raines. Curtis was seen by several people while out that night, but when Rains or the police talk to them they deny it. Eventually Curtis’ best friend (Franchot Tone) returns from South America (I hope I’m remembering this right) and Ella hopes he can help out. Noir icon Elisha Cook, Jr. has a great turn as a crazed drummer. A pretty good B flick, directed by Robert Siodmak. 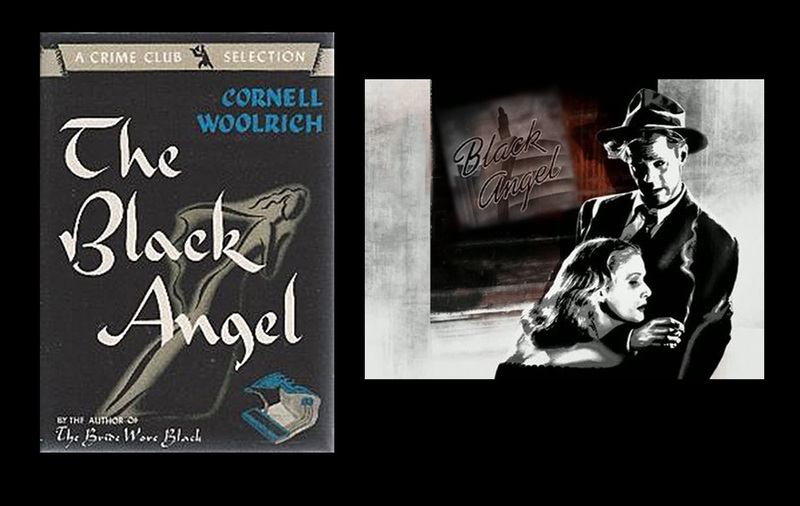 Black Angel,1946: Blackmailer Mavis Marlowe is murdered. Kirk Bennet, a married guy with a loyal wife, is sentenced for the crime. His wife teams up with Marlowe’s ex-husband, an alkie composer and pianist, Dan Duryea, to try to find the real killer before the state executes her husband. Peter Lorre does a turn as a sleazy nightclub owner. Hey, it’s Peter Lorre, can the club owner be anything but sleazy? And any noir with Duryea is worth watching. The Chase,1946: From the No Good Deed Goes Unpunished school of storytelling. Down on his heels World War II vet Robert Cummings returns a lost wallet to gangster Eddie Roman. Roman rewards him with a job as his chauffeur. Eventually Cummings volunteers to help Eddie’s wife, Michelle Morgan, escape her crazy husband. Will they get away to sail into the sunset together? Deadline at Dawn,1946: A sailor wakes up with a stash of cash after a night of heavy drinking (hey, he’s a swabbie, what do you expect). With the help of dance hall girl Susan Hayward he tries to find the woman it belongs to, and does. Just one problem: she’s dead. He’s not sure if he did the deed or not. And now they only have a few hours to find out the truth before his leave is up. 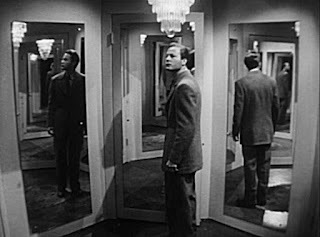 Fear in the Night x 2, 1947 & 1956: A man (who should have been in outer space—DeForest Kelly) dreams he committed a murder in a strange mirror-covered octagonal room. He wakes up with unusual marks on his throat, blood on his sleeve. His cop brother-in-law tries to convince him that it was just a dream—but he’s freaking out. The cop, his wife, DeForest and his girl go on a picnic to a weird house in the woods…and find a mirrored room just like the one he dreamt about. What the hell’s going on?—I have to admit that, while I like all the movies here, I really love this low-budget flick. I’m not saying it’s even good. There’s just something I like about it. The sort of surreal aspect maybe. Remade as Nightmare (the title of the story it’s based on) with Edward G. Robinson and Kevin McCarthy in ’56. Almost an exact remake, but it lacks something, IMO, that Fear in the Night has. 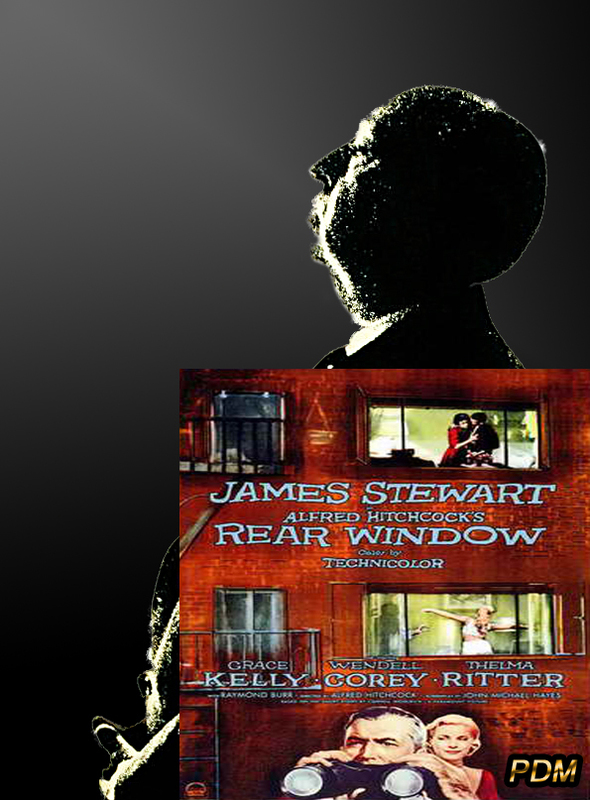 Rear Window x 2 – 1954 & 1998: POSSIBLE SPOILER AHEAD. Forget the 1998 version, though it does have one unique thing. Christopher Reeve plays the wheelchair-bound photog played by Jimmy Stewart in the original. And he’s really confined to a wheelchair because of his fall off of a horse. That’s interesting, but the movie doesn’t touch the original. And for those out there who’ve never seen it, L.B. “Jeff” Jeffries (Stewart) is confined to a wheelchair in his apartment because of a broken leg. He likes to spy on his neighbors in the voyeuristic way that Hitchcock loves so much (Oh, did I forget to mention this is a Hitchcock flick?) So he’s watching his weird, wild and sad collection of neighbors across the courtyard when he sees someone who looks suspiciously like Perry Mason murder his wife. He soon involves his girlfriend (Grace Kelly) and his nurse (Thelma Ritter) in trying to ferret out what happened. Rear Window is one of Hitchcock’s 1950s string of great and classic flicks that includes Vertigo, Strangers on a Train, The Man Who Knew Too Much, North by Northwest and more. Besides movies, Woolrich’s stories have also been adapted for various radio and television shows, including The Alfred Hitchcock Hour, Suspicion, Thriller and Fallen Angels. I picked this group of films from the huge selection of Woolrich adaptations because to one degree or another (not including the Rear Window remake) I like them all and would recommend them as decent adaptations of his work. Woolrich was very successful, but ultimately lived a life somewhat like his stories, sad, friendless and abandoned. There’s something very noir about the way his life played out. And congratulations to O’Neil, Herschel, B.K. and R.T. on their Derringer noms! Good luck! Woolrich was such a fascinating writer--and a fascinating person too, from what I've read. While I do think that his influence is perhaps more strongly felt or remembered through films he was associated with, I do go back sometimes and read some of his fiction as well, which is unnerving in so many ways. He was a master, no doubt about it. JUST finished reading Woolrich's NIGHT HAS A THOUSAND EYES. So damn well written. Never read a Woolrich that didn't stimulate me to write better stuff. His stories are so focused. No fluff. So well plotted and his characters so multidimensional. Love his stuff. I've been saving his New Orleans novel WALTZ INTO DARKNESS for a rainy day - when I can sit back and just read. I agree, Art. He was fascinating on both counts. And I also agree that today he’s probably better remembered via the films based on his work. But hopefully that gets people to go back to the source material. I know that’s what happens with me a lot. I see a movie and then I want to read the book. If reading Woolrich stimulates you to want to write better, O'Neil, that’s a great compliment to him. And I think your idea of reading Waltz into Darkness on a rainy New Orleans day sounds like a perfect day. I didn't even realize Woolrich wrote Night Has 1000 Eyes when I used it as a title, too. I was remembering the song. But I agree that Woolrich moved the bar several notches higher, and the original short story Rear Window was a creepy piece of work that Hitchcock recognized as a perfect vehicle. I've read far too little of Woolrich's other work, but I love The Bride Wore Black. My wife portrayed one of the spied-upon neighbors in the world premiere of the play at Hartford Stage Company late in 2015, and I got to meet the cast and director--Darko Tresnjak, one of the best around now--and it was fascinating to watch them translate a short story from a film into a play, probably the hardest narrative medium of all. And thanks for the Derringer nominee mention. Congrats on your Number ! hit at EQMM. That's a tough spot to compete for. I will have to hunt up some Woolrich. "Rear Window" (the original) is my favorite Hitchcock movie, period. 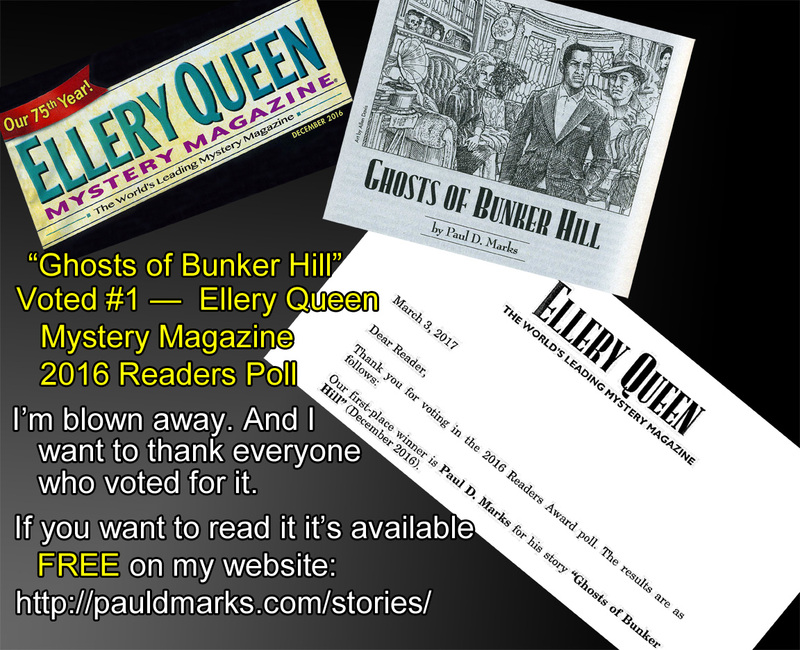 Thanks for that - and congratulations on being #1 at EQMM! The definitive biography on Woolrich is (doubtless) that written by Professor Francis (Mike) Nevins, who is also the noted Ellery Queen biographer. Mike stayed with us a few days last year and I spent the evenings listening, entranced, to his countless Woolrich and Queen anecdotes. Mike's Edgar winning Woolrich opus, First You Dream, Then You Die, is available on Amazon. Interesting column, Paul. I love Woolrich's work. Great suggestions, here, of movies and stories. Dale, I sat beside Mike Nevins at the Edgar ceremony a couple years ago, and his knowledge of all things EQ is amazing. 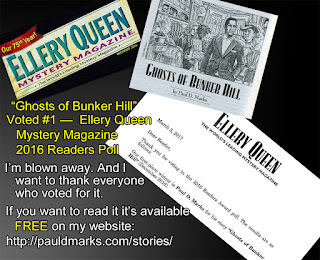 Congratulations on the EQMM award, Paul, and thanks for the Derringer shout-out. I enjoyed your descriptions of the movies. I'll admit the only one I've seen is Rear Window, probably my favorite Hitchcock movie--though it fills me with envy every time I watch it, because the premise is so perfect; just once, I'd like to come up with a premise half as good. I'm going to watch for the other movies, especially Fear in the Night--sounds fascinating. Steve, I think translating a film into a play would be difficult. But Rear Window is a good one to do because it’s pretty much all one location. Thanks, R.T., on both counts. And good luck to you! Thanks, Eve. And Rear Window’s definitely a good one. As I said, it’s part of Hitchcock’s 50s winning streak of terrific films. I have that bio, Dale, but unlike you and John Floyd, I’ve never had a close encounter of the first kind with Nevins. Thanks, John. And cool that you sat next to Nevins at the Edgars. I’m sure you got a ton of good info. Thanks, B.K. And good luck to you! Rear Window is a great “high concept” movie. And I do really like Fear in the Night, but just remember it’s very low budget and not necessarily a great film, just a fun one. I've long liked Woolrich's stories and listened to some on Suspense. I hadn't realized how lonely and sad his death was. I'm off to read your story, Paul! Yeah, Leigh, you'd think with all his success his life would have been more fulfilling or satisfying, but it doesn't seem like it was. Seems like it might have been like Richard Cory, of the poem. And I hope you'll enjoy the story. Paul, just wanted you to know that my husband and I watched Fear in the Night last night and thoroughly enjoyed it. And yes, part of the enjoyment was chuckling at the silly special effects. But we also enjoyed the intriguing setup, and we were both glad when the movie provided an explanation of what happened--not a terribly realistic explanation, true, but an explanation nonetheless. I was half-expecting that the movie would take the easy way out and leave us hanging--and leave poor Vince haunted by doubts for the rest of his life, wondering if he'd really killed someone or not. Thanks for the recommendation!